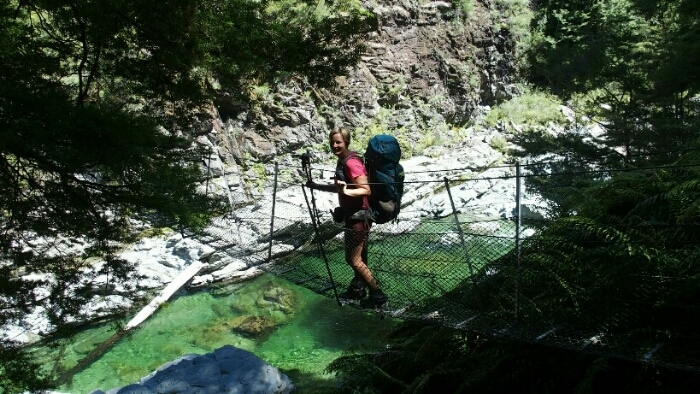 Pelorus Bridge to Browning Hut. 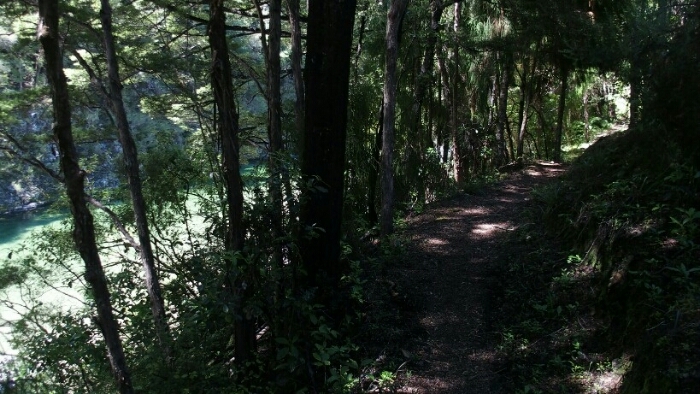 Back on the trail, Pelorus river track. ​Day 82. 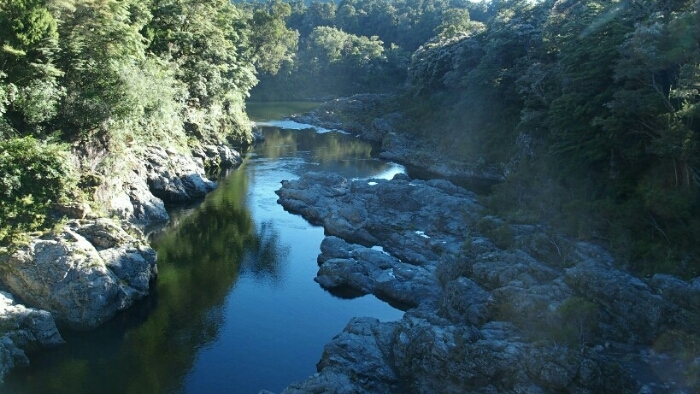 Takaka – Nelson – Pelorus Bridge. Our last lazy morning with a great breakfast (although I actually did get up early to call my parents, outside in the rain as the Wi-Fi in the hostel didn’t work). We then drive back through pouring rain to Nelson where we hand back the car at the airport. As they decline shuttling us back into town we have to take a taxi to the hostel. Coco is staying here tonight and we pick up a late birthday card for Peggy from Germany. There are still a few things left to organise. 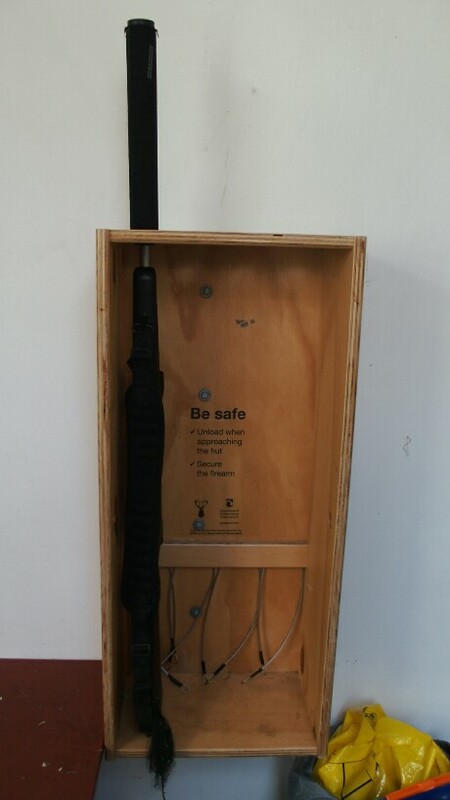 First, go to the post office and send Peggy’s box with stuff she only needs after the trail to Invercargill. Problem, the post office is still on Christmas / New Year holidays and closed today! What now? Coco is leaving early tomorrow morning before the post office opens. We walk to the iSite and check with them, there’s nothing they can do. 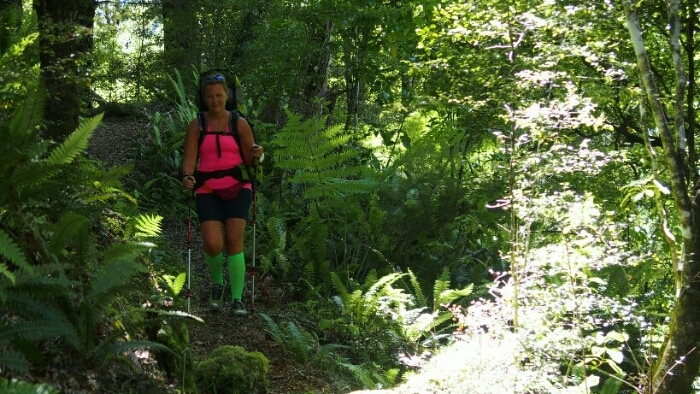 Peggy queues up for her hut pass when I spot Martin and Christian, the German hikers I last saw in Waikanae Beach! 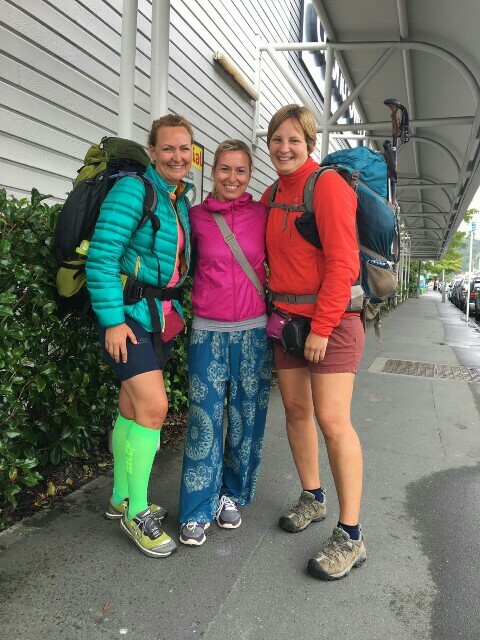 They just hitchhiked from after the Pelorus river track to Nelson and have decided to now do the trail a bit differently, hiking less and hitchhiking more into towns such as Dunedin or Christchurch and see more of New Zealand. They stay in Nelson tonight and agree to send ahead our parcel tomorrow! So nice of them, thank you! Unfortunately we don’t have enough time to chat, we need to buy our resupply for 10(!) 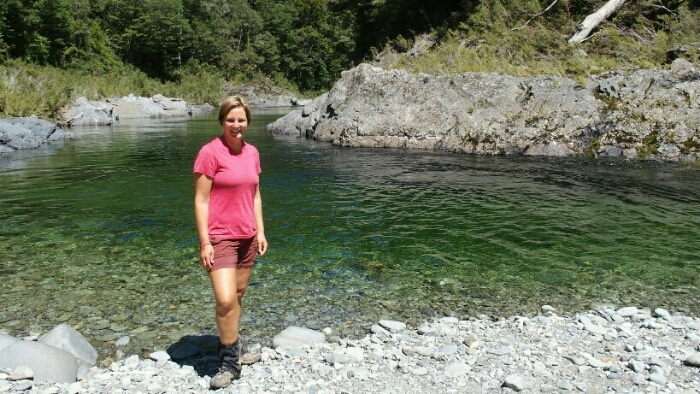 days and then hitchhike to Pelorus Bridge. One hour later (first time buying trail food for Peggy) we walk to the highway. There already is a couple but they are picked up just as we arrive. Then we put our thumbs up, smile at every car hopefully – but no one stops. We realise some other hitchhikers are around and a bit further down, stopping cars before they reach us. We try to find a better spot but no matter what we do the others are always taken first. What are we doing wrong? After 90 minutes a friendly Kiwi is finally stopping. He even takes us the 10km further than his own intersection to Pelorus Bridge as it’s already 6pm and because he is just so nice! The campsite is 18$ per person but very nice with hot showers and a kitchen with gas stoves included (though no plugs nor signal / Wi-Fi). We set up tents, have dinner and are in our sleeping bags at 7.30pm, there are too many sandflies out there and we have a good day of hiking ahead of us tomorrow with our heavy backpacks full of food. I really enjoy that it’s the two of us and not just me now! Day 83. 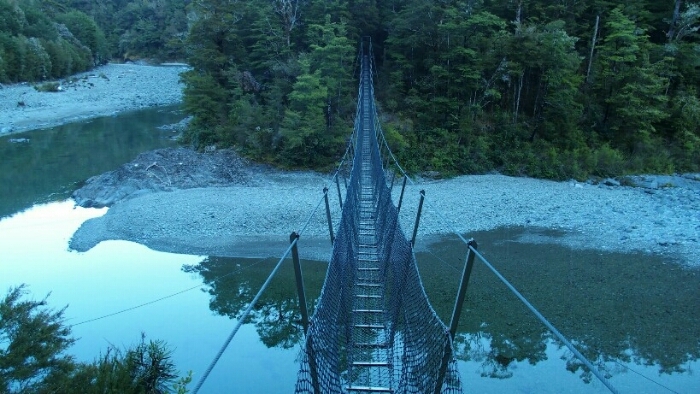 Pelorus Bridge – Middy Hut. 27km. Total 1835km. I enjoyed sleeping in my own tent after such a long time. Just the many people being noisy outside, slamming their car doors etc is unnerving in the early night. I get up at 6am and take a hot shower, the last one for a while! At breakfast we meet a couple who is also doing the TA, but starting with the South Island. At 8am we finally get going, it wasn’t easy to fit all that food into the backpacks, which are now super heavy. First time for me to carry 10 days of food, but even harder for Peggy who is just starting really the trail. But the first 13km are on the road anyway, from tarmac to a gravel road it’s easy walking with just a handful of cars passing by. The landscape is beautiful, hills and mountains to our right and left and ahead as we follow the river in the valley. Pine trees and logged sections alternate. At 11am we are finally at the trail start and have to take our packs off, our shoulders are already complaining! It’s so heavy! 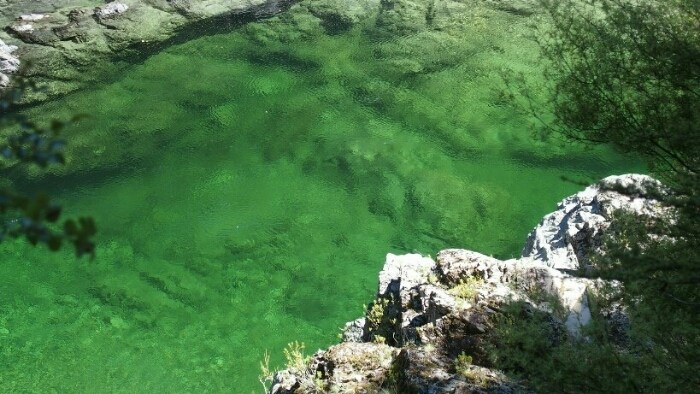 But we know it’s only 1h to the Emerald pool with a picnic area. 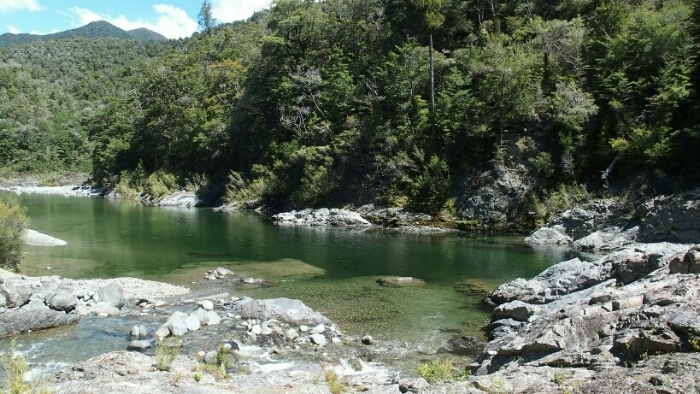 The hike along the Pelorus river is gorgeous. 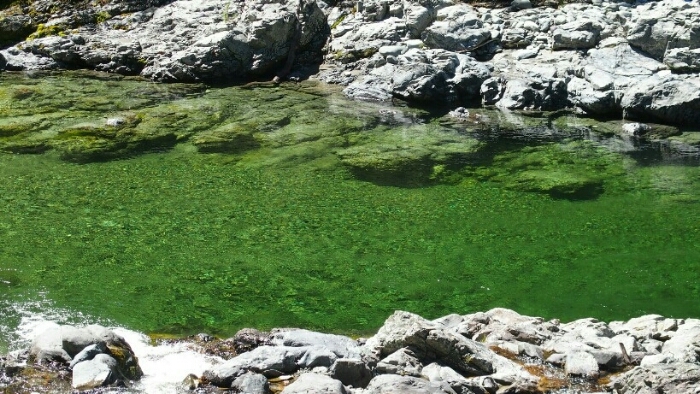 I have never seen such a beautiful green coloured crystal clear river before. 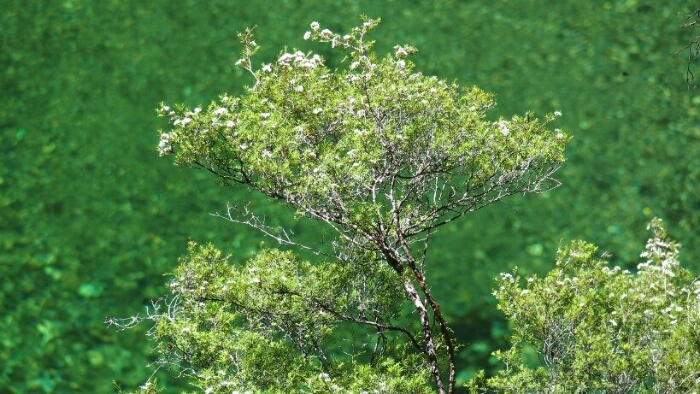 It’s always down below on our left and at the emerald pools we can finally walk down to the river. We want to enjoy it but as soon as we stop a bit longer the sandflies are attacking us. It’s hard to have lunch, they are just everywhere! We have our spray which helps but it’s still annoying to almost eat them as they are flying around our heads. So our break is short, at least the sandflies don’t bother us when we hike. 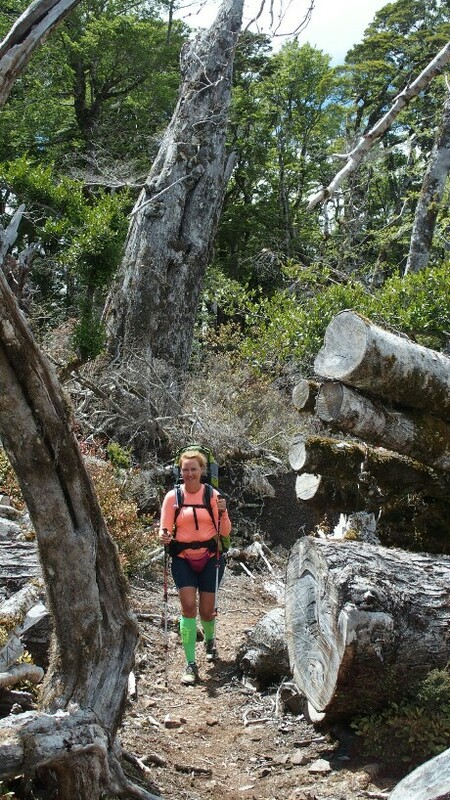 At 3pm we reach Captain Creek hut, where we need to stop and put our packs down, too heavy! 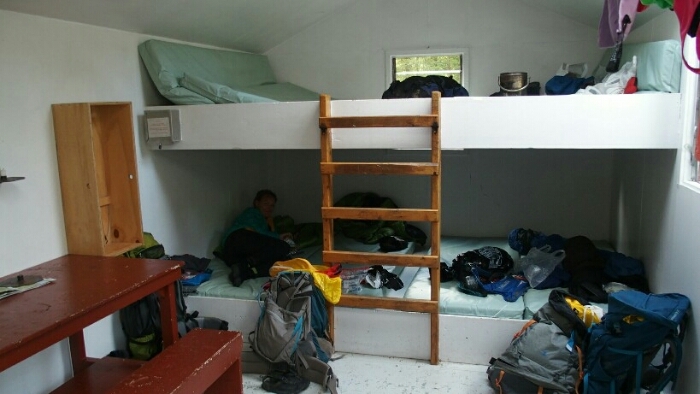 Three hikers are already there, hiding inside a very hot hut from the sandflies since 11am. With this perfect weather we don’t understand why you would be in a hut instead of hiking but well, we are again too much bitten to stay longer. The last stretch is again beautiful through the forest. The heavy packs slow us down and Peggy is struggling, but still we reach Middy Hut at 5.15pm. It’s a small 6 bunk hut and one girl is already there plus a couple camping outside. 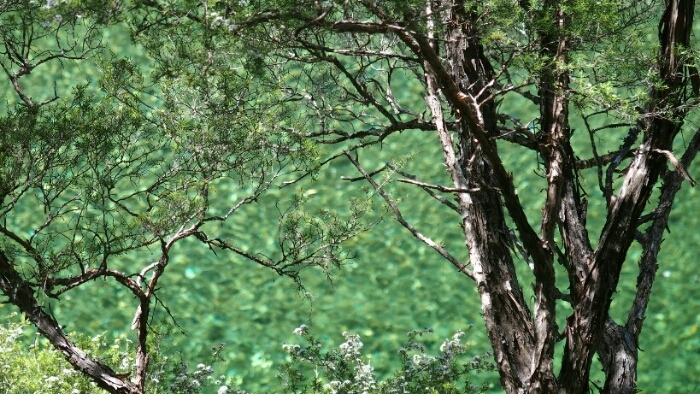 Despite the sandflies we go for a swim, the colour is just too beautiful and we want to enjoy it. One of the Kiwis told us that we have 5minutes to dry and dress before the sandflies attack, i.e. before the body heat is back. 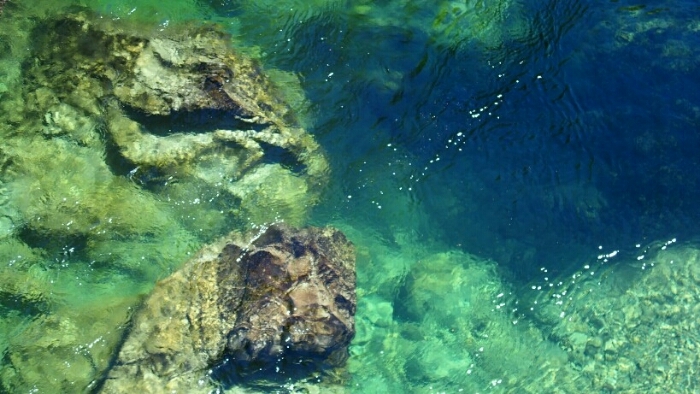 The water is cold and refreshing, we only stay a few minutes inside. Then dinner, stretching and more fights with the sandflies. It’s a sunny evening and pretty warm, still we have to cover ourselves to not be bitten by the sandflies. Impossible for us Germans to leave the hut, the Kiwis seem more resistant. Day 84. 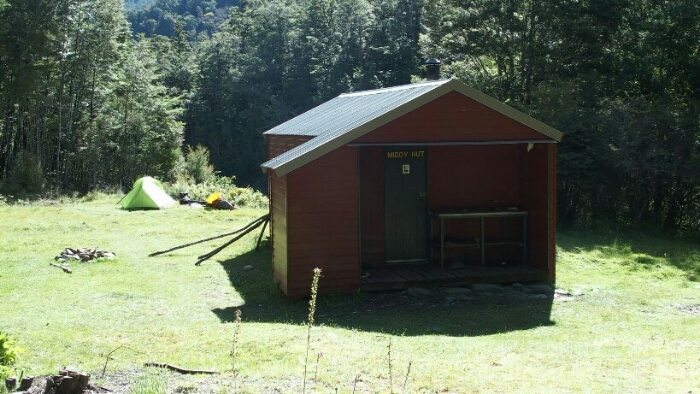 Middy Hut – Browning Hut. 16km. Total 1851km. Not having to pack up the tents means we are much faster this morning, leaving just before 7am. 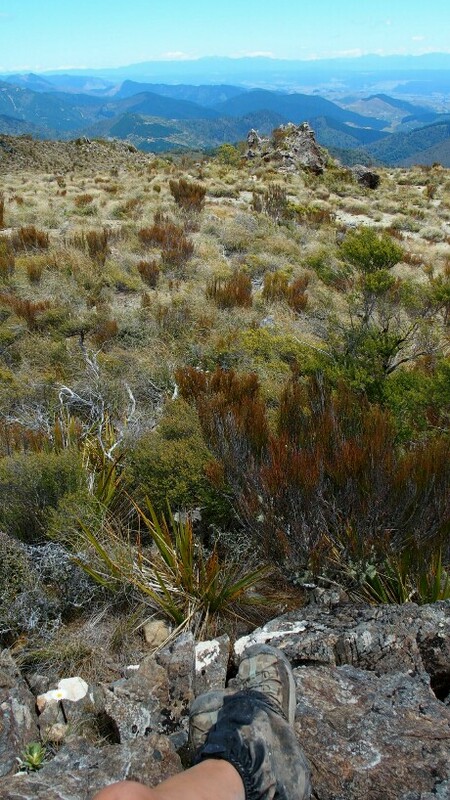 It’s 3h and 5km to the Rocks hut. 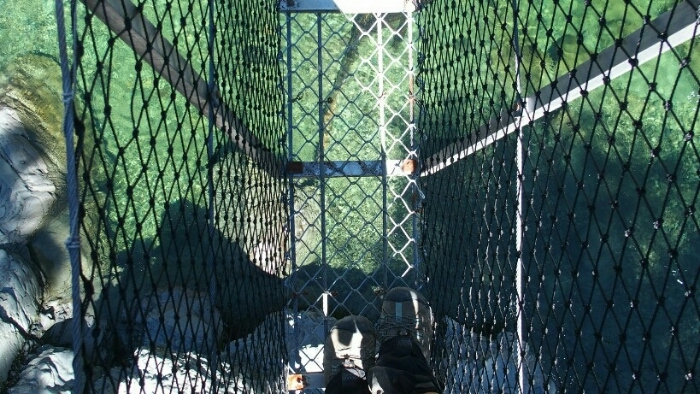 After crossing a swingbridge close to the Middy Hut we have to hike uphill for 600m altitude difference. Although it’s another beautiful day with sunshine, it’s still pretty cold in the morning. I am sweating terribly and my hair is wet, but at the same time I am cold especially my hands. Strange feeling! The forest is really nice and almost no mud. But our packs are still heavy and shoulders sore so we have to take a rest after 90minutes already. One hour later we are already at the hut, faster than expected. It’s 9.30am and there are still 3 people around who are just about to hit the trail. We meet one of them again later, it’s Pawel from Poland who has also been doing the North Island and seen my name in the hut books and is so happy to meet me that he has our picture taken by Peggy. His girlfriend is also reading my blog (Hi!). 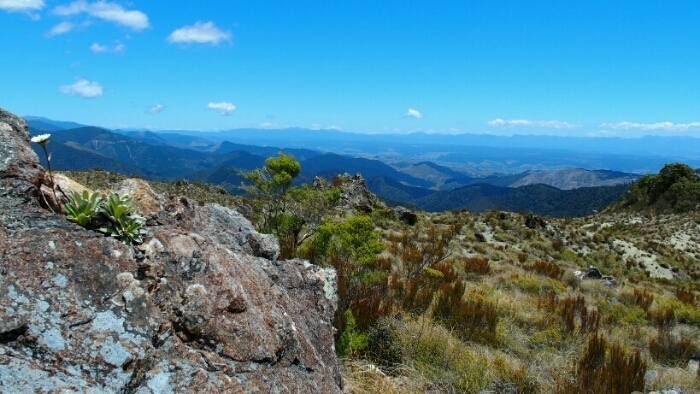 We climb up to some 1000m of altitude and have lunch at noon, resting our shoulders a little while. 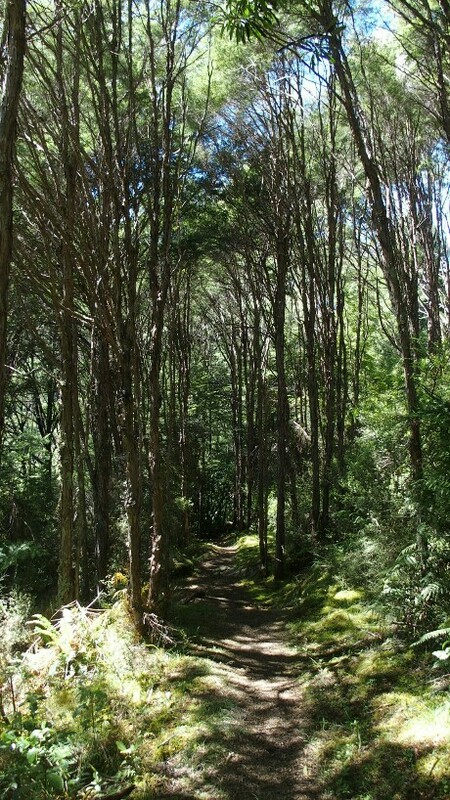 Contrary to the mountains I have been to in the North Island, the tree line is higher here and we are still in a forest. 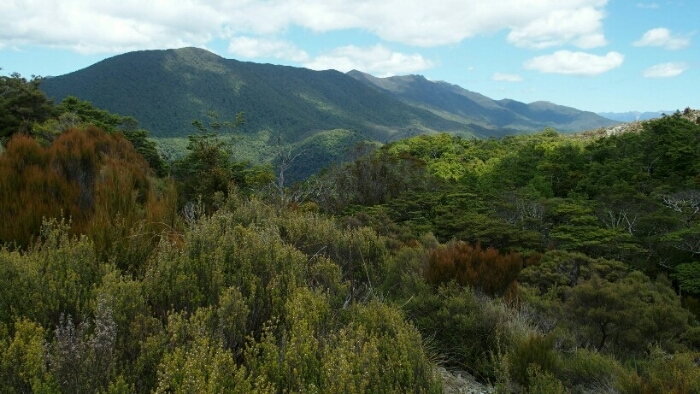 We can get some glimpses of the surrounding mountains though before the trail finally moves out into some tussock and a beautiful view where we take a rest. I also have a phone signal to quickly send a message to my family. Then I realise that the town down there must be Richmond and the sea and mountains on the right side Golden Bay! Well, we didn’t get far yet! 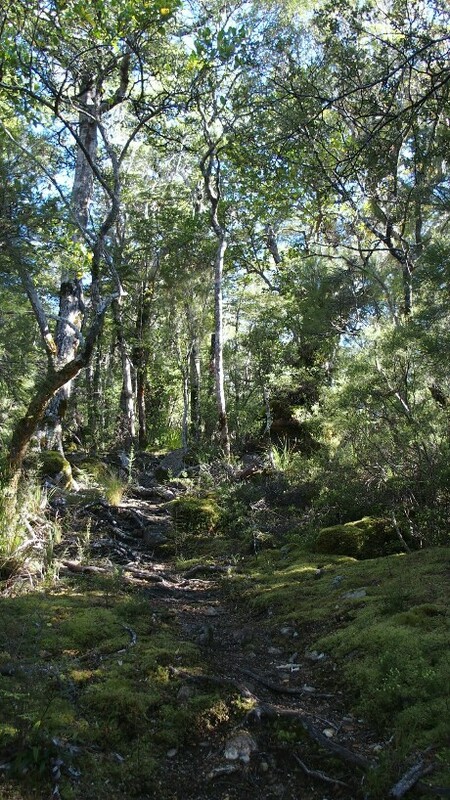 Then we continue downhill, some steep parts until we reach Browning Hut at 3.30pm. We decided to stop here today, the packs are heavy and Peggy not yet used to hiking this way. I wash my hair, do some stretching, filter my water. Then Peggy comes in to tell me one of her insoles is missing! We look everywhere for it, she put it outside as I did to dry, but it couldn’t be blown away by the wind that far! 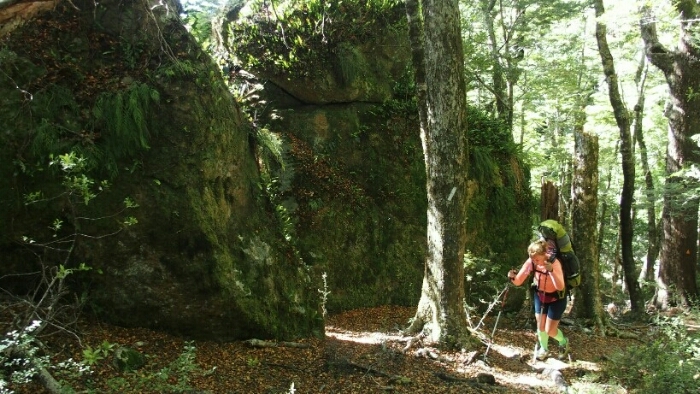 One of the Kiwis staying thinks the Weka took it, so we go and look for it, joined by another Kiwi couple and their dogs. We find the Weka but not the insole. Amazingly helpful as ever, the couple cuts new insoles for Peggy out of their sleeping pad! Wow! Let’s hope that will do the trick, it will be a long time till we will be in a town again! 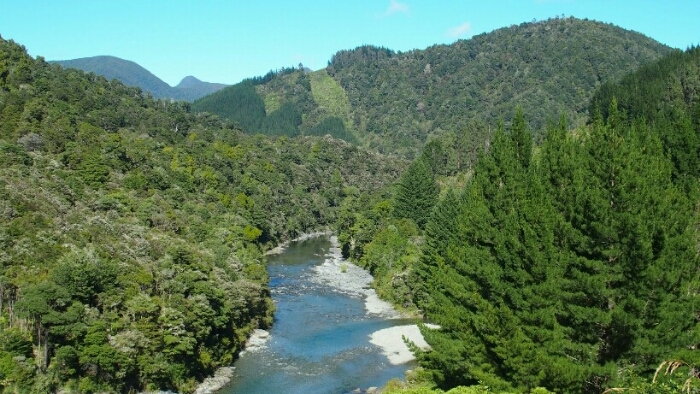 Another Kiwi couple arrives, hunters with their gun. I am not yet used to seeing people with their hunting clothes and a big gun just walking past you. There’s even a specific place in the hut where to store the gun. Plus, they are super young, in their mid twenties maybe! Next Post Browning Hut to Mount Rintoul Hut. Stunning Richmond Range and great weather. There are definitely more hunters ahead – be prepared! Ah I see! It’s you! So funny how things come together 😉 congratulations on being the first Polish through hiker! I heard you are doing many great hikes. Thanks! I’m starting the Appalachian Trail this spring and hope to hike many more 🙂 Maybe we’ll meet somewhere on the trail in the future. 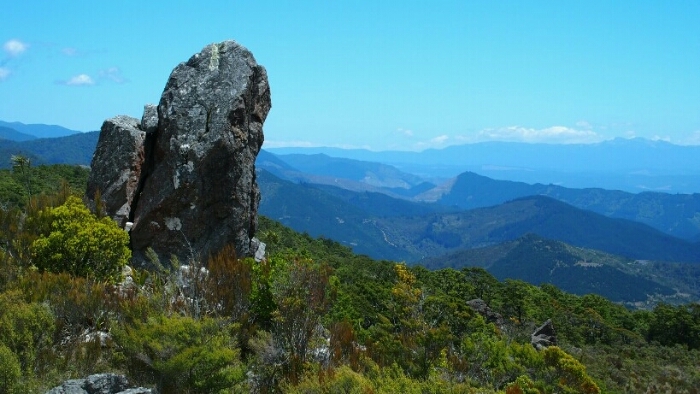 Do you already have plans what are you going to do after finishing Te Araroa? Please send me the link to your blog I would love to follow you as well! I will be heading to Argentina and Chile after the Te Araroa.